Arctic cyclone limits the time-scale of precise sea-ice prediction in Northern Sea Route? Climate change has accelerated sea-ice retreat in the Arctic Ocean. This has various negative impacts including acidification of ocean water and potential contribution to severe winters in mid-latitude regions. However, it has also opened up new opportunities for commercial maritime navigation in summer (Fig. 1). The Northern Sea Route could reduce the navigational distance between Europe and Asia by about 40%, and accurate forecasting of sea-ice conditions has become a major research topic. A team of researchers led by National Institute of Polar Research (NIPR) and Hokkaido University, Japan, have now investigated an operational system in Norwegian Meteorological Institute for medium-range forecasting (up to 10 days ahead) of sea-ice thickness (SIT) in early summer in the East Siberian Sea, which is located on the Northern Sea Route. They reported on their work in The Cryosphere. The team studied the ability of the TOPAZ4 ice-ocean data system to help us to predict the distribution of SIT in this region. Since precise information is crucial for the operation of icebreaker vessels, it is needed to determine the lead time and accuracy of the forecast, and to assess how we could improve predictions in the future. 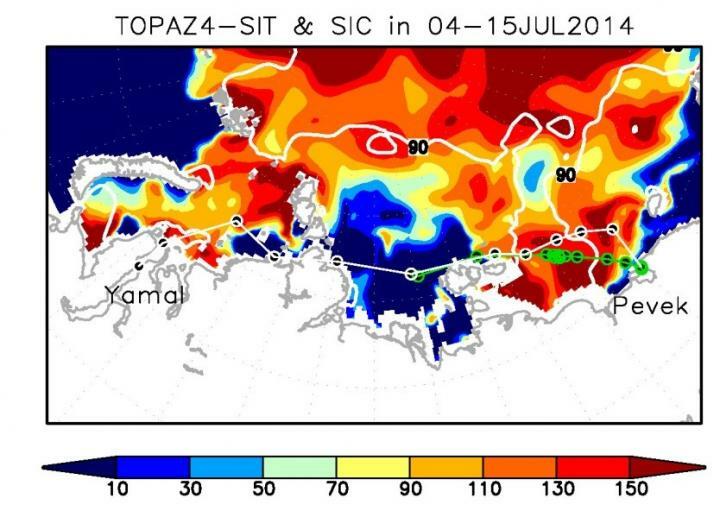 Comparisons between TOPAZ4, other hindcast models, and sea-ice observations showed the system could reproduce the early-summer SIT distribution in the East Siberian Sea. The time-scale for accurate prediction of the SIT in this area was up to 3 days, with skill abruptly decreasing thereafter (Fig. 2). The difficulties in predicting large-scale weather features could be a major factor in this decreased skill after 3 days. This unpredictability arises from the amplification of forecast error for features such as Arctic cyclones, so further work to improve the forecast skill for SIT in this region should focus on understanding the formation and development of these phenomena. Despite this unpredictability, the TOPAZ4 system was found to be reliable for early summer SIT prediction. We examined the model performance for a situation in July 2014, in which two vessels were blocked in the East Siberian Sea for about a week. Based on the vessel tracking data from AIS data, it was found that the vessel speed drastically decreases in the coastal area where thick sea ice (> 150 cm) is simulated (Fig. 3), and the speed of the vessel was clearly negatively correlated with the simulated SIT during the entire passage. These results indirectly support the reliability of the daily mean SIT data from our simulation. More comprehensive analysis is needed based on the speed for a greater range of vessels. This will help to improve the potential of the method to help guide ships along the Northern Sea Route. The article, "Medium-range predictability of early summer sea ice thickness distribution in the East Siberian Sea based on the TOPAZ4 ice-ocean data assimilation system" was published in The Cryosphere at DOI: 10.5194/tc-12-2005-2018.